What does the symbol below mean? Many people have asked me about the meaning of the above symbol (technology). 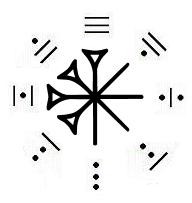 It is one of several symbols revived for the chosen ones, those melaninites with the gift to interpret planetary and cosmic formuli (Laws) and render them operational. Circumscribing the DIN.GIR (Heaven) glyph is an eight-fold array of bars and dots arranged in clusters of three. The bar and dot arrangement can be traced to the reckoning system of the Tutul Xiu (Olmec), the ancient ones. Each bar equates to the number five. Each dot equates to the number one. There are 12 bars and 12 x 5 = 60 and there are 12 dots and 12 x 1 = 12. Hence, the total count for the arrangement around heaven (din.gir) is 60 + 12 = 72. What is the significance of the number 72? The number 72 has many mystical meanings and yet, empirically, the ontologist, can discover that there are 72 years for each degree in the cycle of precession (72 x 360 = 25,920 years). Precession is a change in the positioning of the rotational axis of a rotating body. This change of position is also coupled with a swaying or serpentine motion about the cycle of precession called NUTATION. Planet Earth’s axis is at a tilt of 24 degrees or 1,440 minutes of arc (144) or 86,400 seconds of arc. This is important to know because you can see the relationship with the position of Earth’s axis relative to Light, Force, and the Sun’s diameter (864,000 miles). Could you elaborate more on precession? Precession inherently speaking are changes in points of view resulting in paradigm shifts, gestalt changes, and scientific revolutions on planet Earth. As you know there are 12 houses of destiny in which the Sun and planets appears to travel through and while appearing to travel through each house of destiny, the Sun and planets communicate characteristics, paradigms, codes, cosmic formuli, etc., for planet Earth to render operational (as above, so below). How does the dynamic of NUTATION affect planet Earth? Specifically, nutation affects five geographic parallels on planet Earth: (a) Tropic of Cancer, (b) Tropic of Capricorn, (c) Equator, (d) Arctic Circle, and (e) Antarctic Circle. These five bands (points of reference) around planet Earth transition about the surface of the Earth as a result of the Sun and the Moon. As with the serpentine motion of the precession of the equinoxes, nutation causes the five bands on Earth to oscillate forming serpentine paths along the surface of the Earth. The oscillation of the five bands causes each to have a varied period (frequency) and amplitude along the surface of the Earth throughout the course of the precession of the equinoxes (path of life). The path of life is serpentine in nature and entails the mastery of the Doctrines of Rhythm and Polarity, which are made manifest by nutation. Last edited by Pa Neter Ra; at 03:48 AM..
Good be to you all! What is the Bond-Heaven-Earth (DUR.AN.KI)? In the Holy Bible (El Bib Yloh, al-Bab ilah), the scroll of Matthew chapter 16 verse 19 informs the reader about the exchange of KEYS of the Royalty of Heaven. Furthermore, the same verse continues with the notion that whatsoever one binds on Earth shall also be bound in Heaven; and on the other hand whatsoever one loosens on Earth shall also be loosened in Heaven. For example, the Great Binding Law, also known as the Great Peace (sound right reason), was the ultimate means that had supplanted violence with Right Thinking, Sound Right Reason on Turtle Island. As a result, warring tribes on Turtle Island buried their weapons (e.g., egos) of war and unified under a long house and establishing Right Thinking, Sound Right Reason (The Nubian Mind) as the standard for resolving conflict. How can the connection between Earth and Heaven be accomplished? Let him/her who has an ear, hear intelligently (shama’). In the previous verse of the said chapter (verse 18), it talks about a ROCK; and upon this “rock” or mound of earth, the long house shall be built as a community for members on Earth and for members in the Royal House of Heaven (Orion). Can you demonstrate the bond-heaven-earth (Dur.Ankhi)? Yes. I will demonstrate this mathematically. In retrospect, the answer to the equation nine to the ninth power of nine (the Nubian Number, The Nubian Mind) reveals a 78 digit sequence that are partitioned in groups of threes (as with the neteru of ancient Ta-Mery). The number 78 is an affinity for planet Earth’s rhythmic pulse (i.e., 7.8 cycles per second). Moving on. According to the Nubian Number, the seventh triad is 618 (inverse PHI) and it coincides with the seventh letter made, “G.” Their complements are the twentieth triad 315 (PI) and the twentieth letter made, “T.” Therefore, the mathematical groupings, coupled with their distinctive sounds, are 618-G and 315-T accordingly. Hidden in these groupings are the mathematics for relating parts to the whole (.618) and relating a diameter to a circumference (3.15). The digit sum of 618 is 15, which then reduces to the number 6. The digit sum of 315 is simply the number 9. As there loops are superimposed, the signal geometry is that of spiral galaxies (Hunab Ku), such as your Milky Way galaxy. In addition, the letters and/or sounds associated with the said numbers tells us about the grounding and un-grounding (T) of the whirling power of the etheric force (G), also known as Great Spirit (Kache Manitou). 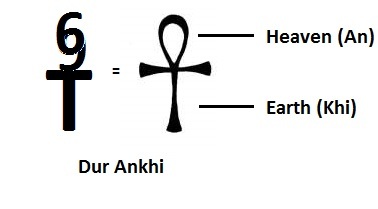 Together, they function like the ANKH, which depicts the womb of woman, the bio-matrix for grounding the whirling power of the etheric force (DUR.ANKHI). Last edited by Pa Neter Ra; at 01:22 PM..